Well things are moving quickly. I started my new job last week and I have to say it's just what I hoped it would be. 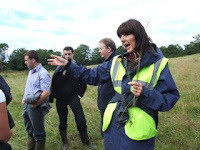 I'll be out in the wilds much of the time visiting farms and drawing up management plans to improve the conservation value of farmland habitats. This first few weeks have been training and job shadowing. There have been some long commutes, up to 100 miles, but hopefully that will reduce when we move house. It looks like we'll be moving at the beginning of September. We managed to get a mortgage and have found a lovely house in Lurgan. It means a big move for the family, but we have prayed long and hard about this and we know it's God's timing.